PITTSBURG, Kan. — Reza Borchardt, like most professional illusionists, was seduced by magic at a very early age. After witnessing his first magic show at the age of 6, he was conducting his own shows less than a year later, wowing his fellow classmates. Though he performs 100 annual shows at The Starlite Theatre in Branson, he loves to take to the road when he can, performing roughly another 100 shows “in other parts of the world.” Reza will be performing two live shows, the first at 6 p.m. and the second at 8 p.m., on Saturday at Kansas Crossing Casino in Pittsburg. This will be his second show in Southeast Kansas; he previously performed at the Pittsburg State University’s Bicknell Center for the Arts. He has purposely steered clear of cliched acts such as “rabbits inside hats,” as he calls it, which is symbolic of magic acts of yesteryear. 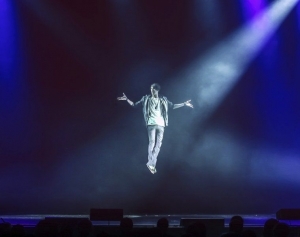 His show, “Edge of Illusion,” is a high-energy production that Reza designed to connect with the audience on a personal level. Comedy and magic, magic and comedy. The two are made for one another. Tricks can be hilarious as well as awe-inspiring, and a few laughs can help a magician distract an audience, diverting their attention away from the trick. 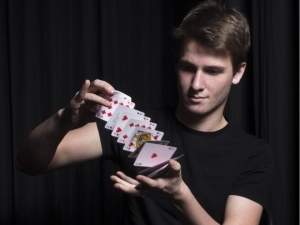 David Eliot mixes magic and comedy with aplomb, joking with the audience while spinning out tricks: card tricks, sleight of hand, catching flying objects in ways that would seem impossible. The Kingston, Ont., native (a fact that elicited a lot of laughs, “Always the appropriate reaction to Kingston) brings his street performance into a stage setting, allowing him to try out new tricks and a fun new setup. His opening trick (which I won’t spoil) was both hilarious and amazing. I spent the rest of the afternoon thinking about the trick, wondering how exactly he did it. It’s what makes the best magicians, tricks that seem impossible and keep you thinking, keep you running it through in your head. Born in Ohio, in 1869, Thurston had a rough childhood that included some time riding the rails. While contemporary accounts reported that he’d been training for the ministry when he decided upon magic, biographer Jim Steinmeyer says that the young Thurston was a near-criminal who escaped institutionalization by saying he had found religion. Steinmeyer unearthed correspondence between authorities about the high-school aged Thurston. “It’s kind of jaw-dropping what they write about this kid,” he says. 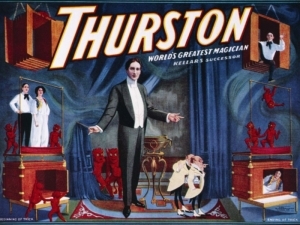 “They say ‘If you don’t take him, he’s at the end of his game.’ And ‘I really think this guy is redeemable, but he’s the roughest case I’ve ever seen.’” Thurston overcame those early trials, hiding his background to become, by the time he reached his early 30s, a stage magician whose success rested in part on his gentlemanly demeanor, what Steinmeyer calls his “bank president” grandeur. Audiences of the ’10s and ’20s loved magic. Many vaudeville shows included magic acts. Thurston inherited the “mantle of magic” from Harry Kellar, who popularized the floating woman illusion, or the “Levitation of Princess Karnac.” Thurston added Ziegfeld-inspired touches to his show, like gaudy costumes for his assistants. And he closely observed European magicians he encountered, as Steinmeyer writes, especially those at London’s Egyptian Hall, where the most accomplished magicians gathered. 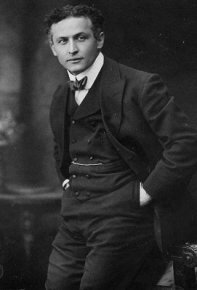 Houdini was capitalizing on the growing fascination with the mysticism and magic of India which had sparked what one commentator described as a “fakir invasion” in the West. Indeed, he was following in the footsteps of many Western magicians who gave themselves titles like “The Fakir of Shimla” and “Fakir of Jeypoor.” These artistes dressed up in outlandish outfits, muddled together tricks from across the world, and passed them all off as Indian. “…Science was able to explain everything, yet the East held out the promise that there were things out there that might not be explicable, that there might be a place where real magic existed. So Western magicians were very keen to exploit this belief,” said John Zubrzycki, the Australian author of the new book, Jadoowallahs, Jugglers and Jinns. In the book, Zubrzycki traces the rich social, cultural, and political history of the art of magic in India. 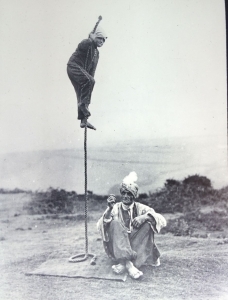 He explores its close connection with spiritualism and the changing roles of the country’s traditional nomadic street magicians, jugglers, and acrobats, once ubiquitous in Indian cities. The author first visited India in the late 1970s and witnessed his first Indian street magic performance in West Bengal’s Alipurduar district: An old man and a young boy performed the classic basket trick—a child enters a small cane basket and appears to be stabbed repeatedly, only to re-emerge miraculously unhurt. It wasn’t until decades later, when Zubrzycki was working on his second book about a diamond trader in Shimla who dabbled in magic tricks, that he thought of tracing the history of the art in India. Zubrzycki has spent the past three years hunting down hard-to-find journals of Indian magic and meeting local magicians to hear about their lives and pore over their personal artefacts. His research took him from archives in Delhi, Mumbai, and Kolkata to London, Cambridge, New York, and Washington DC, where the Library of Congress hosts Houdini’s vast collection of books on spiritualism, magic, and witchcraft, which include many references to India. When the star of a show calmly jokes that he might die on stage, the audience is likely to brush it off. But when the performer making the announcement has a history of holding his breath for 17 minutes, the proclamation might not be far off. 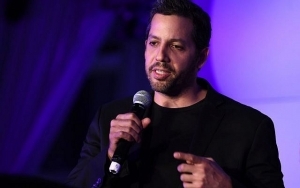 Such was the warning David Blaine, magician and illusionist extraordinaire, calmly told the sold-out crowd at Brooklyn’s Kings Theatre last Thursday night. He then proceeded to hold his breath for 10 minutes while in a transparent tank underwater. Many cheered as the clock ticked. Others looked on in horror and disbelief. “Please nobody ever do any of the things that you’ve seen,” Blaine, 45, told the audience after coming out of the tank, shaking and covered in a towel. “You might just be holding your breath and you think you’re fighting to hold your breath and all of a sudden what happens is you black out, you go unconscious and then the next thing that happens is you inhale water into your lungs and you will die and drown,” he warned. The show on Thursday was the first of two sold out performances in New York City, culminating the end of a Summer tour around the states. Born and raised in Brooklyn, the Jewish magician made his first impression in 1997 with an ABC special on street magic. But his shot to fame came with his high profile endurance exhibitions such as his “Buried Alive” stunt where he was entombed in an underground plastic box underneath a 3-ton water-filled tank for seven days in the Upper West Side. In another one, Blaine encased himself in a block of ice in Times Square for nearly 64 hours. In a 2008 taping of the Oprah Winfrey show he broke the world record, holding his breath underwater for 17 minutes and four seconds. Back at the Kings Theater here, Blaine shocked the gasping audience by stabbing his arm with an icepick, and not drawing any blood when the icepick was removed. He also swallowed an audience member’s wedding ring, retrieving it with the help of a hanger. More swallowing tricks included coughing up his pet frog from his stomach. The tension was palpable, similar to that of a horror movie, when he had two volunteers place an icepick underneath one of three cups. After the cups were moved around, Blaine, who was blindfolded, magically slammed his hands down on the two cups without the icepick. Many turned away as he did the trick, unable to cope with the anxiety. In another stunt he downed several huge pitchers of water, sipped some kerosene and was able to spit out much of the water to extinguish a prop of his logo that was on fire. Throughout the show Blaine performed with supreme confidence and the nonchalance of someone tossing out bags of garbage. The fact that he never raised his voice made his performance all the more mesmerizing and other-worldly. He told the crowd that he eats no food on the days he performs. After the show, fans were mystified. “The amount of self-discipline this guy has is unbelievable,” Shlomo Golombeck of New Jersey told The Jewish Week. On stage, Blaine referenced Harry Houdini and the other great magicians who inspired him. Manhattan resident Jacob Gitzis, said he loved that Blaine is Jewish and he was happy he got a chance to see such a performer in the flesh.